The Parang Ilang has a straight single-edged blade widening to the point with an unusual outline section: the blade is slightly hollowed on the inner surface, and is convex in transverse section on the outer surface. It is often incised with beautiful patterns and decorated with holes and inlaid brass (Lantak Paku). 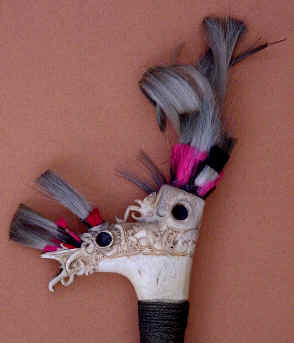 The hilt, usually in deer antler or wood, has fine carvings with grotesque faces or ornaments and it is decorated with tuffs of dyed goat hair. 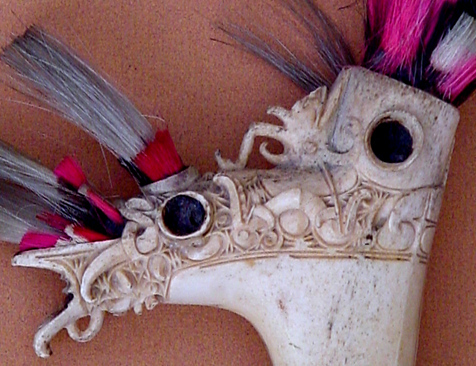 Since the Dayak were head hunters, some believe that the hilt is made of human bone decorated with human hair, but there is no ground to this assessment. 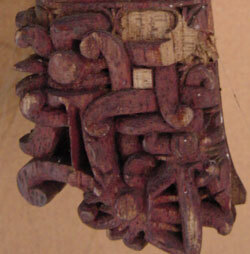 The sheath is made of two pieces of wood bounded together and decorated with elaborate carvings and rattan plaited in a complicated manner. 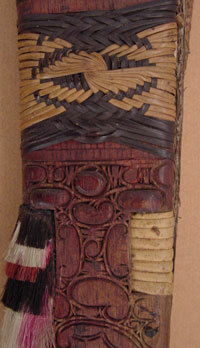 It has a pocket in the back to accommodate the a small knife: the Pue which is very similar to the Pisau Raut used for detail wood carving and trimming rattan. The Kayan name for the Parang Ilang is Malat or Mandau, the Kenyah name is Baieng.